It’s just one of those things about me that I can’t really explain. For many years now, I have really been fascinated by the weather. I have no formal training in meteorology; but over the years, I have come to attain a reasonable appreciation of tropical weather, particularly that pertinent to the Philippines. I visit everyday without fail two weather web sites. 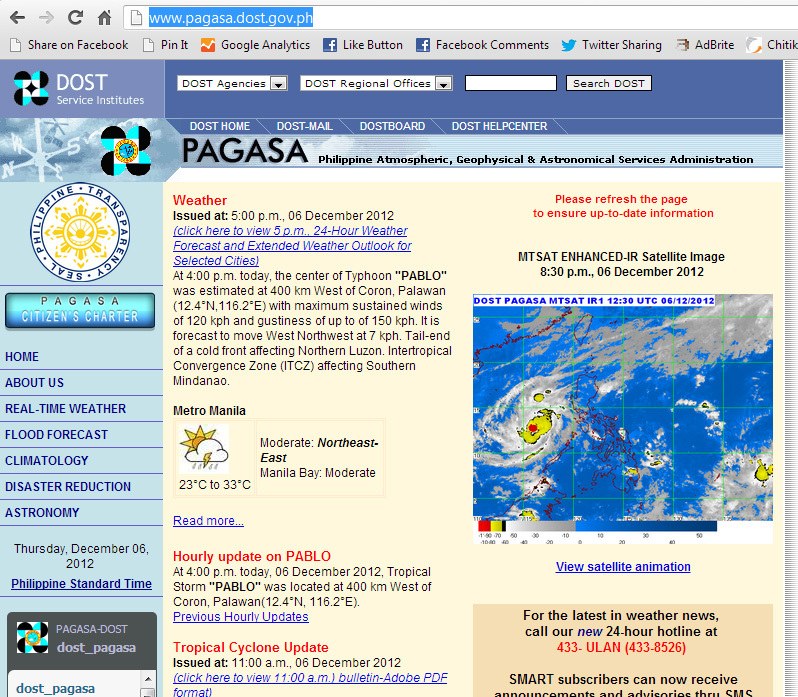 PAGASA is the government web site at http://www.pagasa.dost.gov.ph/. 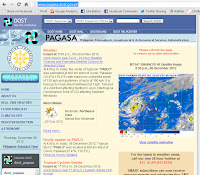 The web site’s reporting has improved by leaps and bounds under the Aquino administration; but if I may offer some unsolicited but constructive criticism, the problem with PAGASA’s web site is that its reporting on tropical disturbances rather tends to pick up only after these enter what is called the Philippine Area of Responsibility or what is known as the PAR. Therefore, people only start to hear of impending systems from PAGASA anything from three to five days – depending on each system’s speed – before each system actually hits land. 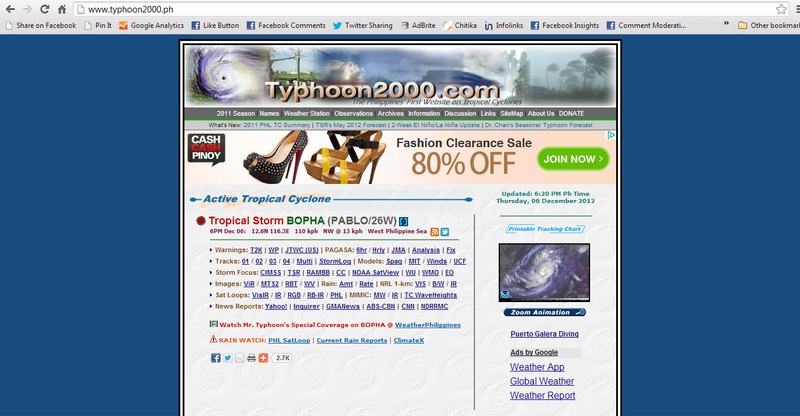 That is why I also make it a point to visit a privately-owned but very reliable web site called Typhoon2000 at http://www.typhoon2000.ph/. 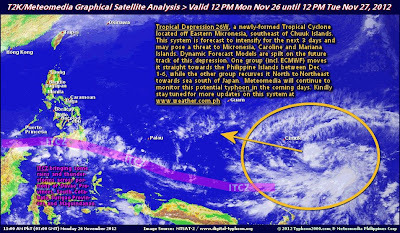 The web site conveniently makes available what it calls a Graphical Satellite Analysis which is an interpreted satellite weather photo which serves as a weather snapshot for the Western Pacific. The analysis not only covers active systems but also gives insights on systems as they spawn and develop. That is also why I was aware of Bopha/Pablo even while it was a cluster of clouds that was starting to threateningly form into a convex. For a few days, the cluster didn’t seem to know what to make of itself; and Typhoon2000's projections placed the probability of a system developing at a low 30%. I was worried, nonetheless. Historical data shows that the more dangerous typhoons spawn late in the year; and November was reasonably quiet in the Western Pacific. If the cluster organised into a tropical system, the conditions were right for it to become a killer. First of all, the cluster was more than a thousand kilometres east of the Philippines, still well wide of the PAR and so unreported by PAGASA. The fact that it was still out in open ocean also meant that it had wide open waters to frolic and gain strength before it encountered land. On the 26th of November, my fears were realised. 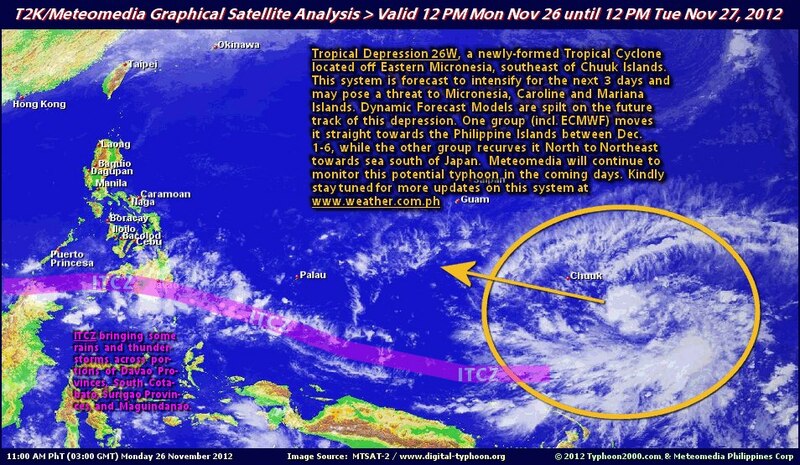 The cluster had become a tropical depression and was given the impersonal name 26W. This was the graphical analysis from Typhoon2000 which I posted on Facebook as an advanced warning to my connections. 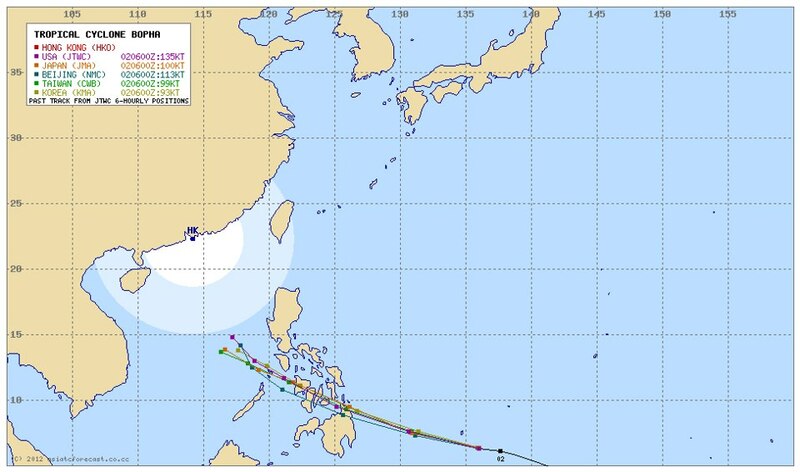 Note that the forecast track showed it to be heading either for the Visayas or even Southern Luzon. Three days later, 26W was upgraded to a Tropical Storm and given the international name of Bopha. Being so far out at sea, its track continued to change from due West – which over time would have taken it straight into Mindanao – or west-northwest, the usual path that storms take heading into the PAR which would have brought the system into the Visayas or Southern Luzon. By this time, even PAGASA was well into the reporting of the system’s movements. Below is the picture I posted on Facebook also courtesy of Typhoon2000. 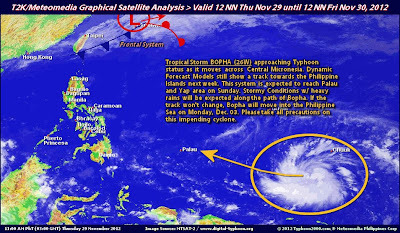 By the first of December, Bopha had already become a typhoon. The picture below from Typhoon2000, which I also posted on Facebook, shows that it became one with still plenty of distance between it and land for it to gather energy and become a really menacing howler. Note the west-northwest track. The next post I made on Facebook on the 2nd of December was Typhoon2000’s aggregation of various agencies’ forecasts. Note that most agencies were in agreement that it would traverse the country through the southern part of the Visayas islands and exit into the West Philippine Sea via Northern Palawan. By Monday night, the 3rd of December, Bopha – already given the local name Pablo – had become a killer Category 5 typhoon. That is the highest in the Saffir Simpson scale of categorising typhoons which means that it had winds in excess of 249 kilometres per hour. 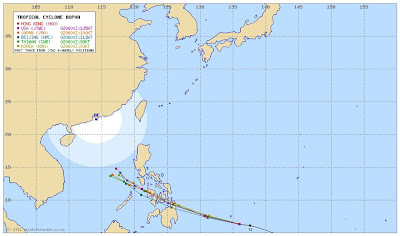 Crucially, the typhoon was heading due West into Mindanao. 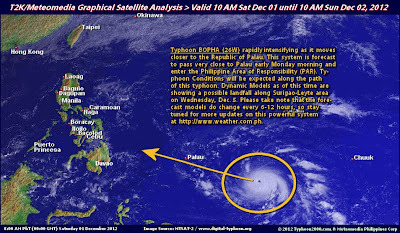 It was in the early hours of the morning the next day that Bopha/Pablo finally made landfall in the Davao area as a Category 5 howler. It quickly lost strength after hitting land, as tropical systems generally tend to do. Those along its way – and Mindanao is not used to typhoons of this strength visiting - were given an experience that they will probably never forget for the rest of their lives. Now that the news teams have penetrated the devasted areas, we are starting to get a grasp for the first time of just how deadly Bopha/Pablo had really been. Whole towns practically wiped from off the face of the earth; acres of coconut trees with fronds blown off by the typhoon; rivers converted into deathtraps by rampaging waters; and lifeless bodies dug out from under seas of mud. It breaks my heart to watch the news; but I do. As a Filipino, I feel that is it is my obligation to, even to just say a silent prayer for the unsuspecting people who had their lives snatched away from them by an off-season killer typhoon by the name of Bopha/Pablo.